Inge’s classic, Pulitzer Prize-winning story about love, lust, longing and disillusionment in a more innocent time and place. PAUL BOLGER (Howard Bevans) is thrilled to be working with the Hampton Theatre Company again. He was last seen as Roger in their production of SUMMER AND SMOKE. Paul was a member of The Manhattan Ensemble in NYC, founded and directed by Raymond Marciniak. Favorite roles were the Lady in LA RONDE and the Senator in TIMON OF ATHENS. Other highlights have been working with his brother John in the Willow Cabin Theatre’s production of Eugene O’Neill’s Sea Plays and being directd by his acting teacher Zina Jasper in 27 WAGONS FULL OF COTTON (Jake) by Tennessee Williams. Paul would like to thank his mom, family and friends for their love and support. LARA BOWEN (Irma Kronkite) is happy to return to the Hampton Theatre Company stage after her debut last spring as Renée in THE ODD COUPLE. Other recent acting credits include Playcrafters productions of THE NERD, PLAZA SUITE, and THE MAN WHO CAME TO DINNER. Lara returns to acting after many years behind the scenes. She directed at risk youth in educational theater presentations for their peers when she coordinated Pride for Youth’s Peer Ed program, and then the Nassau County HIV Bureau STOMP program. Lara attended the B.F.A. program at the SUNY Purchase acting conservatory, and then received her M.S.W. from SUNY Stony Brook. MARC COTTER (Bomber) is an 8th grade student at the Westhampton Beach Middle School and has a passion for acting. This is his first time performing with the HTC. He has appeared in BUGSY MALONE (Fat Sam), OLIVER TWIST (Baits) and SUESSICAL (Wickersham brother). Marc thanks his family, Mark (Dad), Adrienne (Mom), Brook and Evan for their love and support. CATHERINE CUSICK (Millie Owens) is thrilled to be making her HTC debut! Catherine received her B.A. in Drama from Vassar College, and has studied acting at The Stella Adler Studio, Shakespeare & Company, and the London Academy of Music and Dramatic Art. Previous credits include Alcyone in METAMORPHOSES (Molly Thacher Kazan Memorial Prize in Acting), Donna in HURLYBURLY, Julia in TWO GENTLEMEN OF VERONA, Jeanine in RESURRECTION BLUES, and Renée Pélagie in QUILLS. Special thanks to Bob and Bridget Louttit, eternal thanks to Mom and Dad, shout-outs to the Sakmars, and one for Madeleine, beyond honorable mention. JESSICA HOWARD (Christine Schoenwalder) is so happy to be returning to the stage with HTC, especially with such a wonderful cast. Previous HTC productions include: THE ODD COUPLE (Vera), THE OLDEST LIVING GRADUATE (Martha Ann Sickenger), STEEL MAGNOLIAS (Annelle), AH, WILDERNESS (Muriel), and THE CRUCIBLE. Other roles include Portia in JULIUS CAESAR, Ophelia in HAMLET and the mistress in EVITA. But her favorite role is as one of the Howard Sisters, a singing trio. Love you guys! Much love to Seamus, and thanks to Mama, an inspiration. Hey Nanny Nanny! PAM KERN (Flo Owens) is delighted to make her third appearance with the Hampton Theatre Company this year after a ten year acting hiatus (she played Florence “Flo” Unger in the female version of THE ODD COUPLE and Kitty in SIX DEGREES OF SEPARATION). Pam now considers herself the Go To Girl for all “Flo” roles. She received her B.A. in Theatre Arts and English & American Literature from Brown University and an M.F.A. 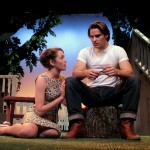 in Acting from the University of Virginia. She is currently in the M.S.W. program at Stony Brook University. Favorite roles include Amalia in SHE LOVES ME, Lenny in CRIMES OF THE HEART, Rizzo in GREASE and the Nanny and the Principal in BABY WITH THE BATHWATER. Pam’s favorite productions are her two sons Richard (8) and Matthew (5). She would like to thank her husband and best friend, John, for his understanding, encouragement and patience. DIANA MARBURY (Helen Potts, Set Decor) is pleased to return to the stage after last fall’s production of FROZEN. It is wonderful to be a part of the opening of our 25th season. The HTC has come a long way since those first years, and there have been many great moments and many terrific people involved in that growth. It would be remiss not to mention our beautiful founder, June (Poonie) Ewing and, of course, our beloved director, Jane Stanton, who was instrumental in putting us on the map. We have been blessed with a dedicated group of people that have stuck together through many ups and downs. We have been fortunate to have the leadership of Sarah Hunnewell over these last years. She has polished our professional image, since taking over the helm as Executive Director. There are really too many people to thank for all the years of delightful productions. It is our hope that this company will continue to entertain and challenge our audience for years to come. Enjoy this charming piece of classic American theater! RACHAEL MCOWEN (Madge Owens) performed with the Kirov and Moscow Ballets before turning to singing and acting. Stage credits include MADAMA BUTTERFLY, PIRATES OF PENZANCE, ANYTHING GOES, CHILDREN OF EDEN, CRAZY FOR YOU, MIRACLE ON 34TH STREET, DRACULA, MACBETH, THE FANTASTICKS, Disney’s HOLIDAYS AROUND THE WORLD and the outdoor dramas TEXAS LEGACIES and HORN IN THE WEST. She was recently part of the original cast of HOMER’S ODYSSEY (Off Broadway). Rachael is a graduate of the Canadian College of Performing Arts. Picnics are her favorite thing! JUSTIN SEASE (Hal Carter) is thrilled to be making his HTC debut and considers himself very fortunate to be playing a role he has had his eye on for quite some time. Justin graduated with a B.A. in Theatre Performance from Christopher Newport University, and also studied at the Stella Adler Conservatory after moving to New York. Justin’s favorite roles include Romeo in ROMEO AND JULIET, Algernon in THE IMPORTANCE OF BEING EARNEST and, more recently, Marcus Hale in a reading of THE CHIMES at the Florida Studio Theatre. Justin would like to thank his parents for allowing him to pursue his dreams, his friends and family for surrounding him with love, Anskers for inspiration, and God for making it all possible. 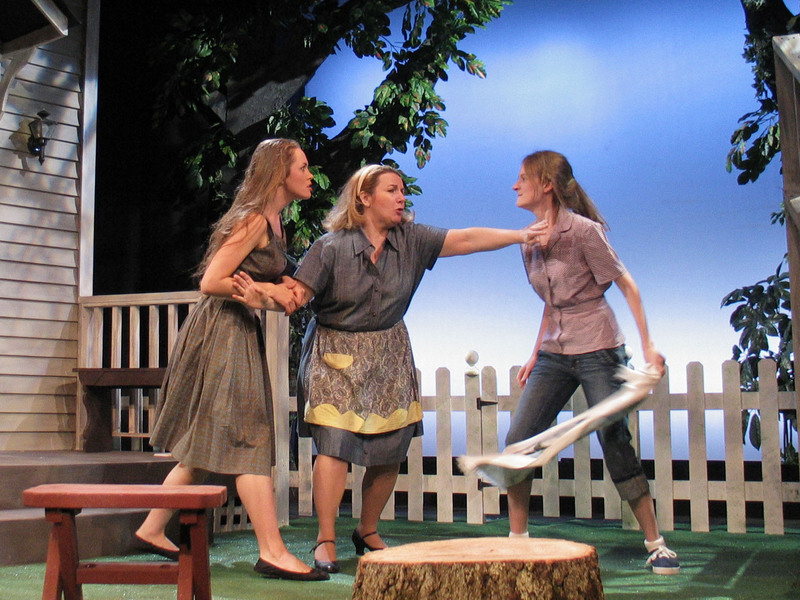 FRANCES SHERMAN (Rosemary Sydney) is happy to kick up her heels with cast and crew in this production of Picnic. There is a list of professional credits in all media that she’ll be happy to ‘dish’ about upon request (bring your own jug). Favorite stage roles include: LADIES AT THE ALAMO (Bella), STEEL MAGNOLIAS(Shelby), THE ROBBER BRIDEGROOM (Goat’s Mother), and TARTUFFE (Marianne). In Quogue, she especially enjoyed THE ODD COUPLE (female version) as Mickey the Cop. For Michael and Jeff – 143, and thanks to Cmentmixer, Coach and the friends who continue make the work possible. NICHOLAS YENSON (Alan Seymour) has performed as an actor, dancer, and singer in nine countries and makes his Long Island debut with PICNIC. His American regional theater credits include productions at Theatre Rhinoceros, New Conservatory Theatre Center, 42nd Street Moon, Broadway with a Twist, and Firebelly Productions. Dance credits include three national tours with Riverdance, two European tours of RAGÚS, A CHRISTMAS CELTIC SOJOURN on PBS, and an apprenticeship with Dana Tai Soon Burgess & Company. Nicholas studied at the Hong Kong Academy for Performing Arts and is a graduate of the University of Limerick. WILLIAM INGE (Playwright) began his theater career as a drama and music critic for the St. Louis Times. While there, he crossed paths with Tennessee Williams, whose production of THE GLASS MENAGERIE so inspired him he decided to try his hand at playwriting. His first play, FARTHER OFF FROM HEAVEN (1947), was produced at Williams’s recommendation. His next play, COME BACK, LITTLE SHEBA (1950), earned him the title “most promising playwright of the Broadway season.” Next came PICNIC (1952) which won Inge a Pulitzer Prize, the Drama Critics Circle Award, the Outer Critics Circle Award, and the Theatre Club Award. BUS STOP (1955), veering into a lighter vein, was next, followed two years later by THE DARK AT THE TOP OF THE STAIRS, a reworking of his first play and his most autobiographical. Inge was hailed as the next Tennessee Williams but his latter works did not fulfill that promise and proved a series of box office failures. Among them were THE LOSS OF ROSES (1960), NATURAL AFFECTION (1963), WHERE’S DADDY? (1966) and THE LAST PAD (1970). His only real success of that period was his screenplay for “Splendor in the Grass” (1961) for which he won an Academy Award. Convinced he could no longer write and plagued by depression, Inge took his life in 1973. Well now. 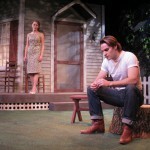 The community theater season has definitely, undeniably begun. 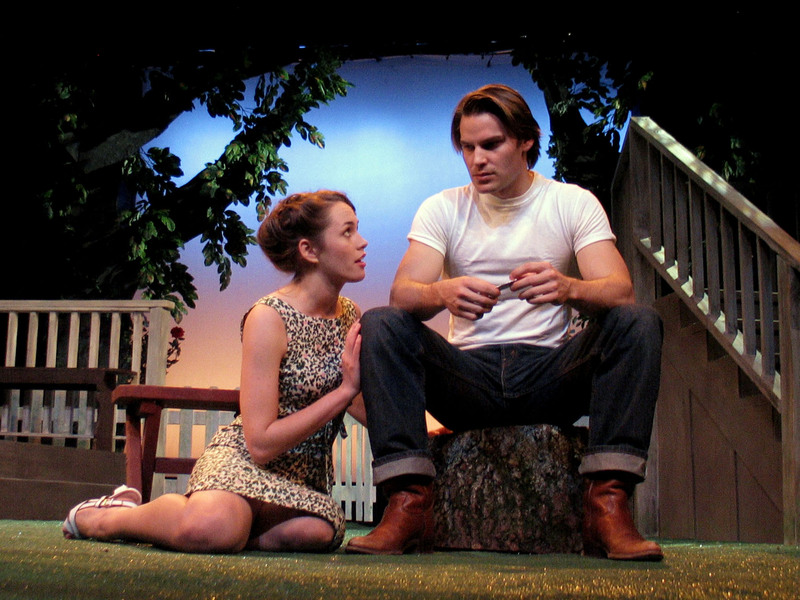 The Hampton Theatre Company, celebrating its 25th year, has mounted an impressive and absorbing production of William Inge’s 1953 capturing of Midwestern angst, “Picnic.” It was a good choice. Anyone with a TV or a DVD player or a sense of romance has undoubtedly experienced the movie version with William Holden, Kim Novak and Rosalind Russell. Good flick. Nice music. But Inge wrote “Picnic” for the stage, and it’s on the stage that it comes most fully to life, in all its three-act depth and dimension. Though “Picnic” buzzes along on its comic surface, it’s the undercurrent of sadness and discontent, of dreams shattered, deferred, or tainted that gives it substance. Every one of the eight major characters carries some pain or vulnerability to hurt beneath a deceptively simple and bouncy exterior. And the power of “Picnic” resides in the masterly way Inge unveils each of these hidden darknesses. Though he never achieved the exalted status of Arthur Miller or Tennessee Williams or Edward Albee, with whom he shared a particular point in time, his thoroughgoing understanding of his medium and his ability to construct situations and characters that tug at the heart as well as the mind will forever secure his place among the major American playwrights. On opening night, one of the audience members mused aloud, “I’d forgotten what a good play ‘Picnic’ is.” Of course, the production aided his evaluation mightily. First, it’s splendid looking. James Ewing and Sean Marbury are carrying on the tradition that the late Peter Marbury and Mr. Ewing established with elegantly, realistically detailed sets that add authenticity down to the smallest detail. And Sebastian Paczynski lights this with impressive, moody variety and sensitivity, except for one brief scene, in which a monster moon is hung in the sky, which has the effect of turning reality into cartoondom. But this passes, and the acting under the impossible moon counteracts its presence with taste and talent. As always, Teresa Lebrun’s costumes are beautifully period realized. The Hampton Theatre Company has instituted, within the last few years, a practice of inserting an Equity actor or two into its casts. There are three professionals in “Picnic,” and they’re all terrific. But so are the non-Equity members. In fact, director George A. Loizides has knit together one of the most effective and spirited ensembles the HTC has ever put on a stage. Mr. Loizides has a fine sense of stage pictures, constant, original and motivated movement, and an unerring sense of pace and sensitivity that moves the evening along at a brisk but tender clip. The casting is unerringly on target. Westhampton Beach eighth-grader Marc Cotter is delightful in a small role as Bomber, a young paper boy whose humor and appreciation of feminine beauty are in development. Jessica Howard and Lara Bowen are two country schoolteachers and town gossips down to their fingertips. Pam Kern is solidly stolid as Flo Owens, the single mother who tries valiantly to bring up her two inspired daughters rightly and as rigidly as they’ll allow. Diana Marbury is unfailingly droll as Flo’s neighbor, and she counterbalances Flo by showing far more interest in making real connections with the rest of the world and its inhabitants. 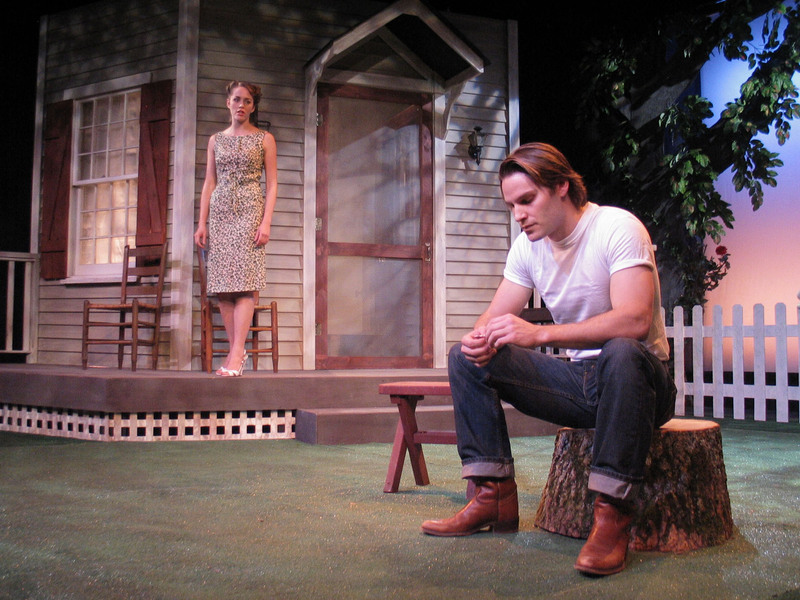 Nicholas Yenson is effective as Alan Seymour, the very straight-edge beau of the most beautiful girl in town and the fraternity brother of the stranger who manages to stir up the heretofore placid emotional waters of a small Kansas town. Paul Bolger is rotundly genial, romantic, and frightened as Howard Bevans, the suitor of Rosemary Sydney, the old maid teacher who boards in the Owens house. As Rosemary, Frances Sherman lines out a character more subtly haunted by the passage of time and youth than Rosalind Russell in the film. And she conveys tellingly the tragedy of the desperation that middle age without an anchor can wreak on a woman. Her scene with the drifter is a fevered and touching one. Catherine Cusick is a stick thin, marvelously multifaceted and achingly sensitive Millie Owens, a profoundly bright and confused teenager, who is, in her way, wiser than the adults she has to endure. 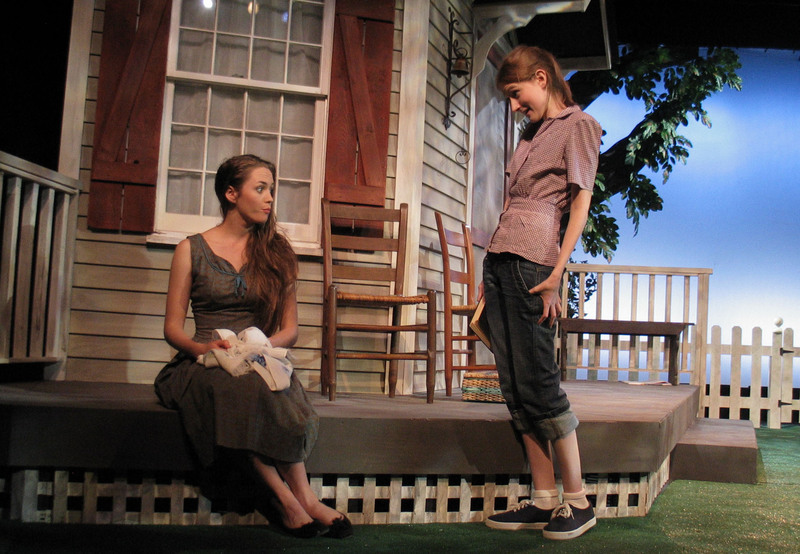 She, along with her older sister Madge, develops from child to the brink of womanhood as the play progresses, and Ms. Cusick makes it all real and tangible. 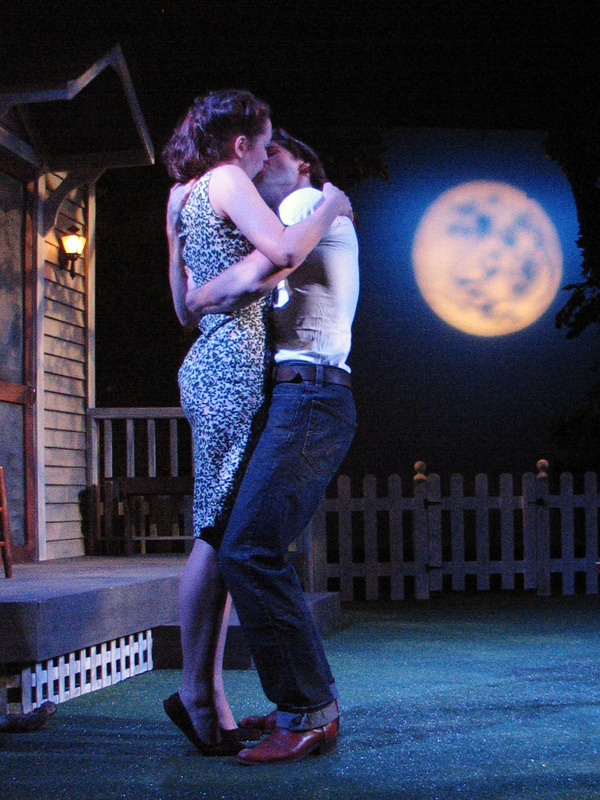 The two main characters, developed most fully by the playwright, are Hal Carter (Justin Sease) and Madge Owens (Rachael McOwen.) Mr. Sease is erotically electric as the mysterious and loquacious traveler who appears without invitation in the morning of the preparations for a town picnic. His sensuality is palpable and his scenes with Madge have an energy of the flesh that is as magnetic as it is basic and earthy. Rachael McOwen brings to the role of Madge grace and energy and multiple dimensions that are spellbinding. Strikingly beautiful, with a flowing mane of brown hair, she moves across the landscape of the plot with the weightlessness of a dancer, and conveys a vivid sensuality imprisoned in a face and form of winning innocence. As the play progresses, the bonds that keep this innocence contained palpably loosen, as her self-perceived fate as a mere small town pretty face fades and she ignites under the spell of the by-now not so mysterious stranger. 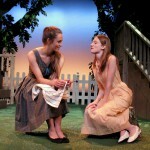 When it’s well and gracefully done, “Picnic” is a play that touches many strings in an audience, and the current production of this timeless play by the HTC does just this. 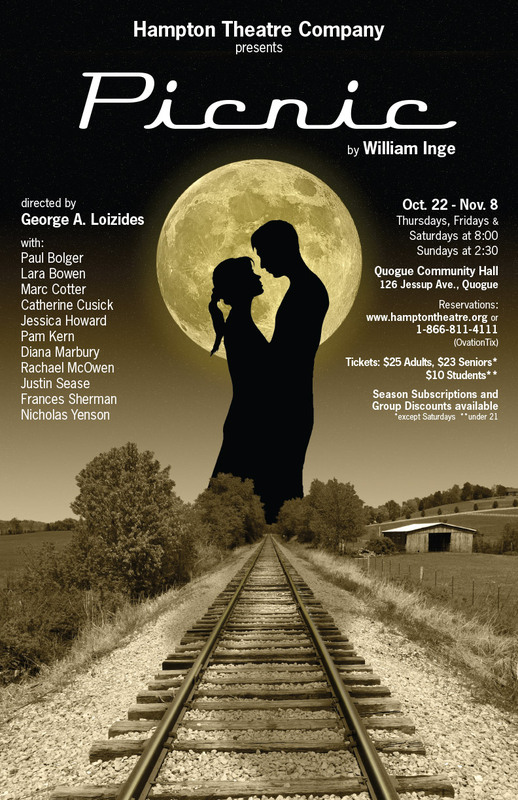 The Hampton Theatre Company opens its 25th anniversary season with an American classic. 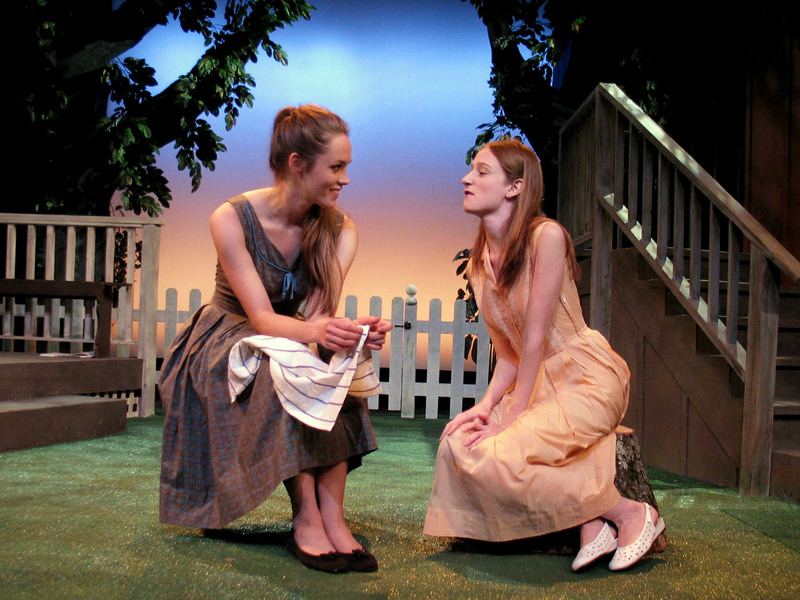 We never see the picnic that gives William Inge’s 1953 Pulitzer-winning play its name. It’s Labor Day, and the schoolteacher in Flo’s boardinghouse will return to work tomorrow. It’s also back to school for Flo’s youngest daughter, smart-as-a-whip Millie. But today’s all about the picnic and dreams of a proposal for older daughter Madge, the pretty one, from her doting boyfriend, Alan, whose family is among the richest in this small Kansas town. But there’s a distraction in the yard shared by Flo (Pam Kern) and her neighbor, who’s hired a young drifter for yard chores. He’s worked up such a sweat that he doffs his shirt. The only female who appears not to notice is Madge. Hal, the stranger whose body gives credence to his claim of football stardom before he flunked out of college, was Alan’s frat brother. As Hal, Justin Sease cuts a hunky figure, but also masters the fine line between bravado and insecurity. Rachael McOwen reveals Madge’s own beauty-over-brains insecurities, while Catherine Cusick as the kid sister restlessly expresses sibling envy without admitting so. 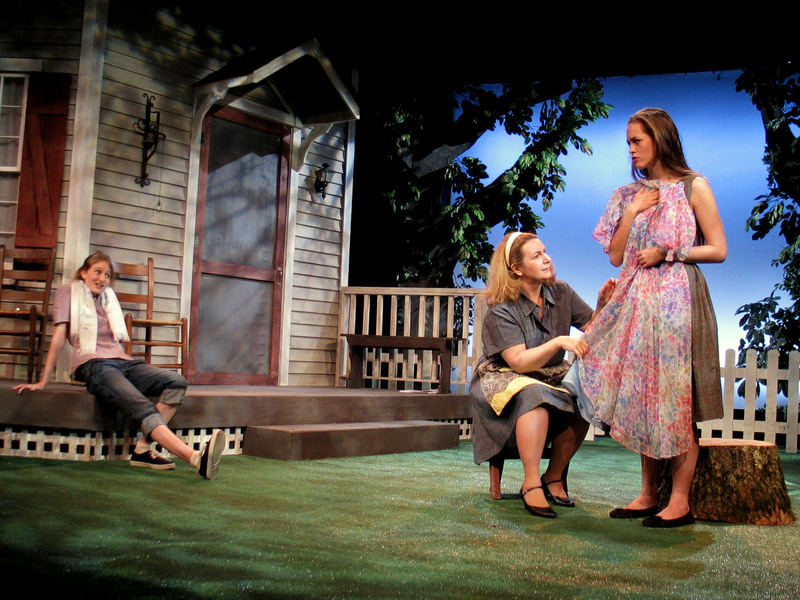 As Alan, Nicholas Yenson is helpless around Madge and wary around Hal, while Frances Sherman paints a laconic portrait of a desperate “old maid” schoolteacher. She’s dating a merchant (Paul Bolger) who thinks marriage may be good for business. 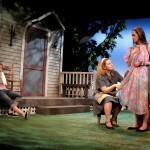 As the neighbor, Diana Marbury returns to the stage on the whitepicket-fence set codesigned by son Sean and by James Ewing. 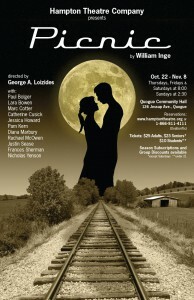 George Loizides directs Inge’s masterpiece with an unhurried Midwestern pace. Don’t let the slow Act I simmer discourage you. The pot will boil, and you’ll feel the heat.